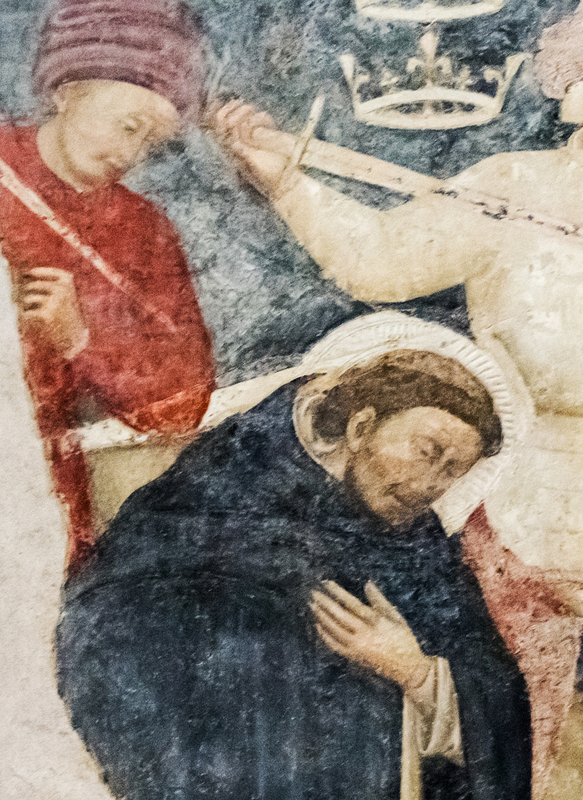 At the age of sixteen, a young man named Peter received the habit from the hands of Saint Dominic. Some thirty years later, his efforts to convert the heretics of Lombardy found consummation in his martyrdom. He is best known for his final act of piety, marking the scene of his martyrdom with the first words of the Creed in his own blood. As with most of us, surrendering his pride, his dreams, or his life did not always come easily to Peter. Once, as a young religious, he was falsely accused of having female companions in his cell (he had, in a vision, been carrying on a spiritual conversation with three early virgin-martyrs). He complained to the Lord in prayer about this situation, but the Lord simply pointed to His Cross and reminded Peter of the false accusations that had placed Him there. As he grew in his religious life, Peter developed his preaching abilities and drew great crowds. Sometimes, he preached even on a blistering summer day. To the dismay of the heretic hecklers, the Lord would answer his prayers and provide shade for the congregation. He prayed each day as he said Mass that he would be able to offer his life for the Lord who had died for him. Little did he know how that prayer would be answered in 1252 when he offered the ultimate sacrifice of his own life.